Info "Roll left and right to defeat the evil bugs! Your quick moves and paw cannon will bring you to victory! Mewtroid is a minigame souvenir found in the Games folder in WarioWare: Twisted! and in the Minigames section in WarioWare Gold. 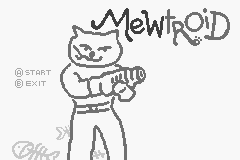 Its name is a combination of "mew," a sound typically associated with kittens, and Metroid. The player controls a cat named Sameow, whose name is a combination of "meow," a sound that cats make, and "Samus" (Sameow was unnamed in WarioWare: Twisted! ), and must shoot down as many bugs as possible. When rolled over, Sameow can shoot from her arm cannon. In WarioWare Gold, her movement is controlled via the D-Pad, and twisting the system will allow her to aim. She is also given the ability to use a move called the rolling dash when the system is sharply rotated. Each time thirty bugs are defeated, a powerful bug that takes multiple hits to shoot down will appear. If Sameow touches a bug, the game will end. This page was last edited on September 27, 2018, at 15:38.